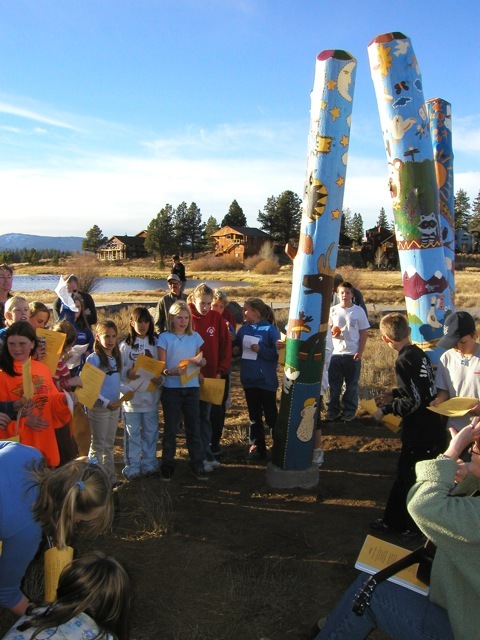 In the 2003/2004 school year Nancy Lopez collaborated with the Glenshire Elementary fifth grade students and teachers with Randi Thompson from the US Fish and Wildlife Services to create beautiful totem poles displayed in the student’s neighborhood. The students learned about the environment through a class workshop with Randi and then the students collaborated with each other to create a wildlife scene that they painted on the totem poles. This art project won the Roots and Shoots activity report sweepstakes and more importantly the students ranked this project their favorite of the whole year. 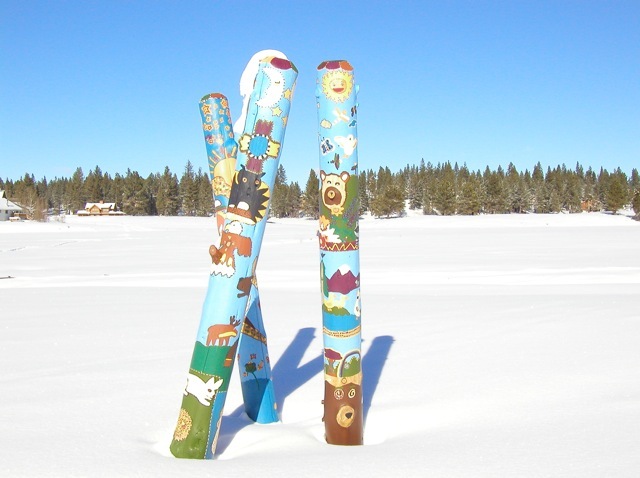 The totem poles are featured at the trailhead of the Glenshire pond and helps to educate the public on the local flora and fauna of our area. In the past 15 years the totem poles need repainting and this fall would be a perfect time to work with a new group of students to recreate the totem poles. We are requesting funds for design, painting, and securing the totem poles near the Glenshire Pond and designing, painting, installation of a new community art project in the meadow of Glenshire Elementary School. The results that we strive to achieve are to provide young people (5th graders - approx. 90 students) with in-depth arts and humanities experiences that develop techniques and skills for creative inquiry. Also, to help students understand and appreciate their local wildlife and watershed area, understand the creative process through mentorship with a professional artist, and for students and teachers to experiment with materials, techniques, and processes in the painting with emphasis on the social function of art. The new art installation at the Glenshire Elementary School meadow would be seen on a daily basis by the students and families who attend GES. It would also help to education the public on the local flora and fauna in our meadow. Fall -Winter 2018 Classroom Instruction with all 5th grade classes at Glenshire Elementary in conjunction with Junior Botany and preparation for Sagehen Outdoor school. Nancy Lopez, will work with teachers to design with students, meet with engineers and volunteers, draw patterns with students, resurface poles, paint with students, purchase paints and other needed art materials, and facilitate on-site painting of poles with students and teachers. During this time, the design and planning will occur for the new art installation that will be in the Glenshire Meadow next to the school. A second grant will be written if more funding is needed for the new art installation. It is possible that the new art installation may require additional funding that we would seek in the next grant cycle. However, we anticipate being able to find volunteers and donations of time and materials. All 5th grade students, approximately 90 students, will participate in this project. The new art installation will benefit the entire student body of Glenshire Elementary and the Glenshire Community. Glenshire PTO is aware of the project and will help find volunteers to implement the new art installation. The new art installation in the Glenshire Elementary Meadow would be dedication to Kathleen Jensen, our beloved secretary who passed away this year.